Regular PCWorld readers may recall Cinnarch, a Linux distribution I covered last fall that combined Arch Linux with the relatively new and alternative Cinnamon desktop environment. Making good on their promise, the team this week announced the birth of Antergos, a brand-new Arch-based Linux distribution that's based on GNOME 3 instead. “After a month since our last release under the name 'Cinnarch,' we’re glad to announce the new name of our project and our first release being out of beta,” the team wrote in a post on Sunday. “We’re stable enough to make this step. Still based on Arch Linux, the distro aims to provide a “modern, elegant, and powerful operating system” that's both easy to use and customizable. 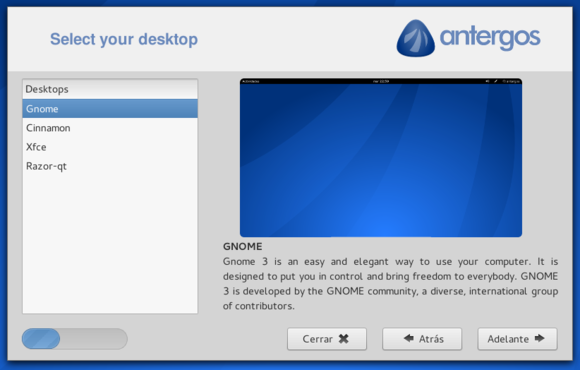 Antergos is notable not just for its use of GNOME 3 by default, but also for its Cnchi graphical installer, shown below, which now lets users opt to install Cinnamon, Xfce, or Razor-qt as well. Four desktops are available through the Cnchi graphical installer. Numerous bug fixes were also incorporated in Antergos, which should be installed as a replacement by all Cinnarch users. Directions for doing so are provided on the Antergos site, as are free, downloadable .iso images for 32- and 64-bit computers.